Sometimes you may need a large vacuum that will handle any kind of dirt and grime in a big area. Other times you may just need a quick and convenient vacuum that will help you tidy up your home. That’s where the Hoover Corded Cyclonic Stick Vacuum, SH20030 comes in. This vacuum is lightweight, but still strong enough to pick up dirt and debris on both hard floors and carpet areas. It is easy to maneuver around furniture and other objects and is even easier to store. Its sleek design makes it easy to handle and put away into small closets. The ease of use and the versatility of this vacuum make it one of the most popular on the market. It is easy to get out when you have a quick mess to clean up and don’t want to get out your heavy vacuum cleaner for it. If you have pets, this will be especially convenient since you will always have a mess to clean up. Since it is lightweight, it can be used on a daily basis without going through a hassle to get it out and put it up. The dirt cup at the bottom of the machine is easy to see and can let you easily dispose of the dirt when it gets full. While this vacuum will work on both hardwood floors and carpet, it is best used on hard floors. Many people have said that it doesn’t do that great of a job on thicker carpet, but it is decent on shorter carpet. If you are looking for a vacuum to cover a large space, then this may not be the vacuum you are looking for. It is good for small areas and quick clean-ups, but it isn’t suited for replacing your regular large vacuum cleaner. What Makes You Want to Buy this Vacuum Cleaner? The Hoover Corded Cyclonic Stick Vacuum, SH20030 is one of those vacuum cleaners that you will use a lot more than you think you will. Just think about how many times you have had a small mess that you didn’t want to get out your big vacuum cleaner for, and the small handheld vacuum wasn’t strong enough for. When situations like that happen, a lot of people just let the mess sit there until the rest of the floor is messy enough to justify getting out the larger vacuum. This vacuum cleaner solves that problem. It is light enough and strong enough to get out for just about any mess that you or anyone in your house makes. Amazon has the Hoover Corded Cyclonic Stick Vacuum, SH20030 on sale for right around $65, so you won’t have to break the bank to get this versatile little vacuum. In fact, after the first couple of uses, you will realize how great of a value that it really is. If you’ve ever gone shopping for a vacuum cleaner, you’ve likely seen more than one with the Hoover name on it. 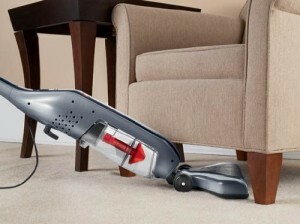 Hoover is a company that’s been in business since 1908 and they are still the leader in vacuum manufacturers. In fact, the brand has dominated the industry so much that people sometimes say that the need to get a “Hoover” instead of a “vacuum.” It’s that type of brand recognition that has made them successful and they continue to produce quality vacuum cleaners at different price points to be attractive to all types of consumers.